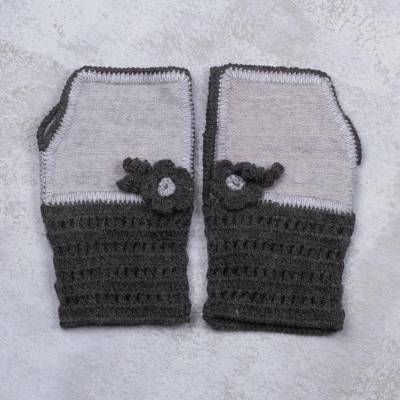 Alpaca Blend Fingerless Mitts in Grey from Peru, "Cozy Flowers in Grey"
Made of soft alpaca blend material, these charming fingerless mitts are presented by Celinda Jaco. The Peruvian artisan chooses colors of oyster and elephant grey. Each mitt features wonderful crochet work that is performed by hand, accented with a little flower shape.